Indira makes our napkins, placemats, and other table linens with the Association of Craft Producers (ACP). 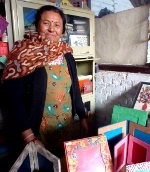 ACP, one of the largest artisan organizations in Nepal, has helped many low income women escape from a life of poverty, harsh working conditions, and exploitation. Hasroon makes our crocheted coin purses, hats, and scarves with Padhma Creation. Like Indira, Hasroon, too, was married at eighteen. Her husband's family demanded additional dowry money but Hasroon's family was unable to pay it. Hasroon was beaten, doused in gasoline, and set on fire. She survived and was rescued by a women's shelter program, Padhma Creation. 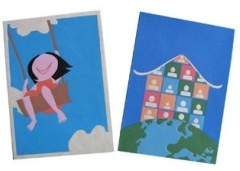 Sundari makes our notecards and other handmade paper goods. Sundari came from a very poor family and received only a basic education. Married and with two sons, she joined Bhaktapur Craft Paper (BCP) which was then a project of UNICEF Nepal. Her children received on-site daycare and from her earnings with BCP, she was able to send them both to school through Higher Secondary Level (equivalent to an Associate's Degree). Both sons went on to become national soccer players.